Bad Times at the El Royale - 4K UHD Review - ReDVDit! Bad Times at the El Royale is a 2018 American neo-noir thriller film that was written, produced, and directed by Drew Goddard. 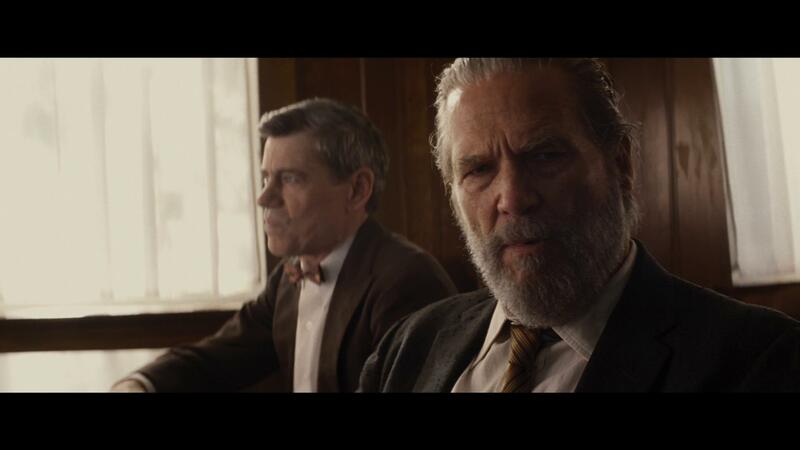 The film stars Jeff Bridges, Cynthia Erivo, Dakota Johnson, Jon Hamm, Cailee Spaeny, Lewis Pullman, Nick Offerman, and Chris Hemsworth. Set in 1969, the plot follows seven strangers each hiding dark secrets, who come to a head one night in a shady hotel on the California-Nevada border. 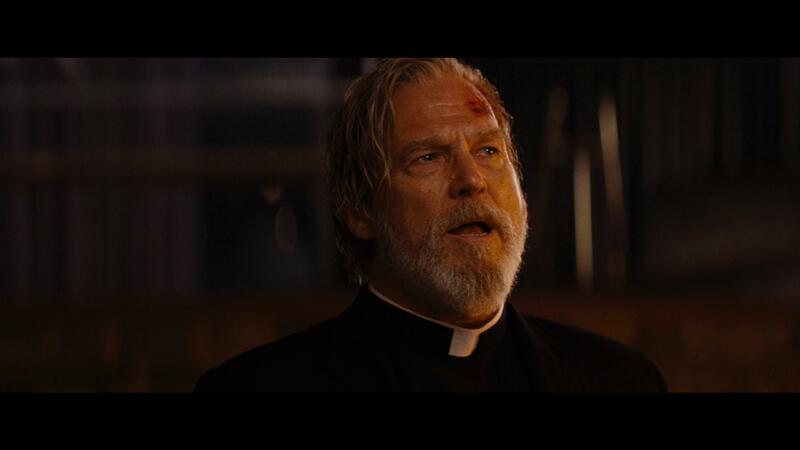 Following Catholic priest Daniel Flynn, singer Darlene Sweet, salesman Laramie Seymour Sullivan, and the sarcastic Emily Summerspring as they arrive at the El-Royale, where they meet the hotel’s only employee, Miles Miller. 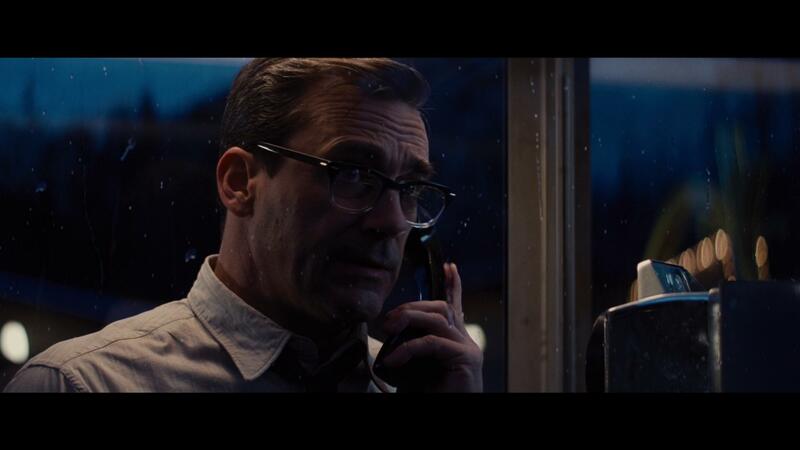 Bad Times at the El Royale is another feature film that prides itself on being an ensemble film with an all star cast. Beginning with a brief account that appears to be taking place in the 1950s as a man is arriving at the hotel, checking in, and starts pulling up the floorboards of his room. With its blatantly theatrical presentation, in both story and presentation, this movie might not be for everyone (especially with the fact that it feels very Tarantino-esque), it gives audiences some considerably visceral and exciting content that really lets it deliver a great experience. Sure, there are some questions that went unanswered as the movie progressed onward; but, if you can look past the bits like that, overall it’s an extremely fun and surprising night on the couch. 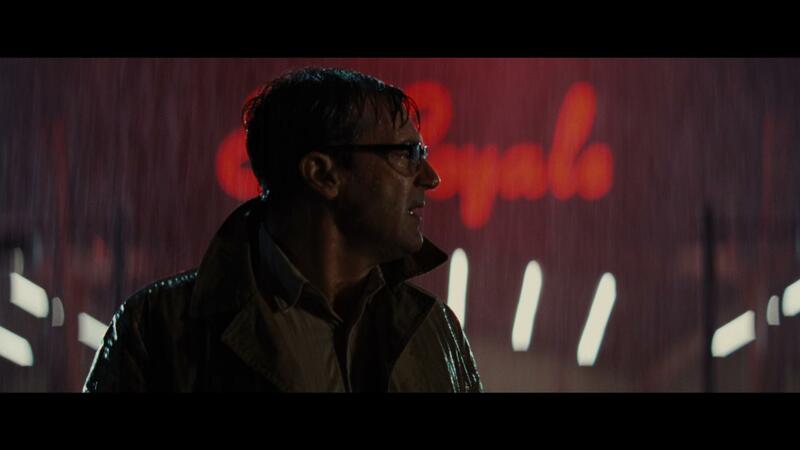 The 4K UHD release of Bad Times at the El Royale is presented in 2160p with an aspect ratio of 2.39:1. The release, at a whole isn’t something that’s jaw dropping and it won’t really provide the type of visual experience that gives it the opportunity to be a feature piece of your collection. The overall finer details of the presentation were very noticeable throughout the movie. And the overall colorization of the scenes, while they were decently distinguished, this release would have done a lot better had they opted to go with a Dolby Vision presentation. The visual presentation overall was clean, and my wife and I were able to see and understand everything as it progressed; however, I feel that they could have done a slightly better job with the release to ultimately make the visuals pop better. 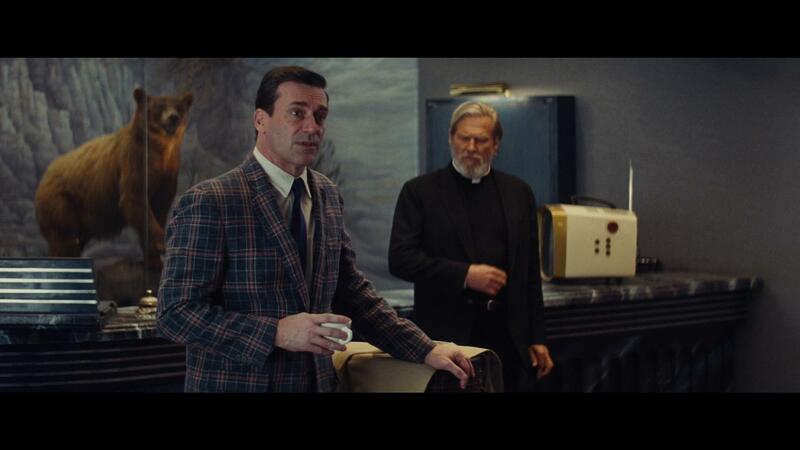 Packaged with a Dolby Atmos Audio track, the 4K release of Bad Times at the El Royale offers an absolutely all out immersive audio experience for its viewers that are able to make use of the technology. With its gut punching delivery of surround activity, this release really sets the bar in terms of audio presentation and the effective use of the various channels that are enclosed from within. The use of the musical score throughout the film is of note because of not only the fantastic timing with the elements of the movie, but really helped to set the pace and the overall emotional aspect of a given scene. The dialogue and the effects are delivered with superb clarity, allowing audiences to experience a problem-free and clean presentation so that there are no issues and a great experience to be had by all. 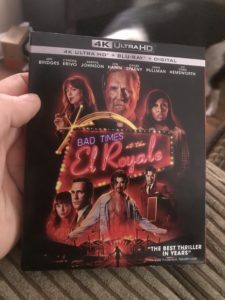 The 4K release of Bad Times at the El Royale comes packaged in your standard two-disc 4K UHD amaray case. Within that case is the standard 4K copy of the movie as well as the standard Blu-ray copy. Neither of the discs feature any artwork that’s related to the movie outside of the standard release text and solid colored background. 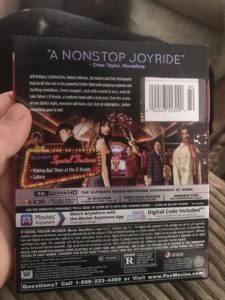 There is a digital copy redemption pamphlet included, as well as a slipcover that’s been made available during the first pressing that features the same artwork that’s been made available on the case. 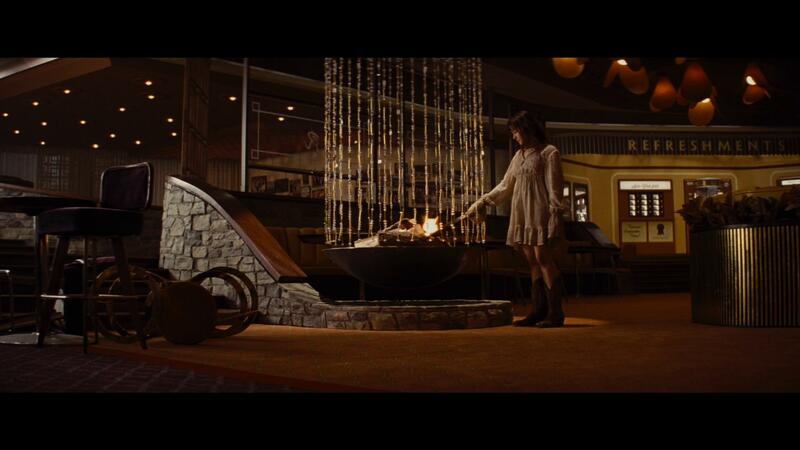 Overall, I found Bad Times at the El Royale to be quite the fun experience, and can really see the Tarantino vibe that people have been talking about. Despite the handful of unanswered questions that I had by the end of the movie, I found everything to be an exciting time, and the overall delivery of the storyline to be one of my personal favorites in recent times. The visual presentation of the 4K release could have been handled better had they opted to include Dolby Vision with the release; but, the use of HDR10 allowed for a clean and distinguishable presentation when comparing it to the included Blu-ray copy. The audio track of the UHD release was absolutely phenomenal and really packed an immersive punch that really put my receiver through the wringer. Special features, well what was included was nice and offered a nice backstage look; but, there should have been more included and at least some kind of extended look at the storyline. If you’re considering this release for your collection, I’d definitely recommend picking it up. Bad Times at the El Royale is available on 4K UHD, Blu-ray and DVD.